A landmark new law seeking to protect women from domestic violence has come into effect in India. The law also bans harassment by way of dowry demands and gives sweeping powers to a magistrate to issue protection orders where needed. Every six hours, a young married woman is burned, beaten to death or driven to commit suicide, officials say. Overall, a crime against women is committed every three minutes in India, according to India's National Crime Records Bureau. Despite the scale of the problem, there had been no specific legislation to deal with actual abuse or the threat of abuse at home. Domestic violence, under the new law, includes "actual abuse or the threat of abuse whether physical, sexual, emotional or economic," a statement from the federal ministry of women and child development said. "We have been trying for long to protect women from domestic violence. In India alone, around 70% of women are victim of these violent acts in one or the other form," junior minister for women and child development Renuka Chowdhury told the Press Trust of India news agency. She said the news law would help provide relief to the women suffering from domestic violence. Women's activists have welcomed the law, although many say it is not perfect. They say a bill alone will not help in preventing domestic abuse; what is needed is a change in mind sets. 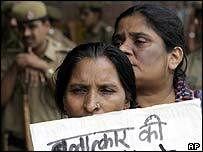 A survey by the International Institute for Population Studies showed 56% of Indian women believed wife beating to be justified in certain circumstances. The reasons varied from going out without the husband's permission to cooking a bad meal. Domestic abuse is often denied by the victims themselves.